Over 100 years ago, where visitors now view the world-famous Butchart Gardens, immigrant workers from India and China laboured to remove limestone for the cement plant of the Vancouver Portland Cement Company. In the nearby woods and fields over 200 Chinese and Sikh workers lived in the long-vanished shantytown of Tod Inlet. The only evidence today of this immigrant community rests in the artifacts buried at the site of the old village. Archival film depicts the arrival of Chinese labourers who came to work at the Tod Inlet cement plant, hired through firms specializing in cheap oriental labour. 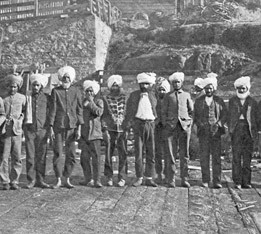 Sikh men from a few villages in the Punjab came to B.C. in village groups to seek work in a new promising new country, a part of their own British Empire. In telling the story of these immigrants, the film introduces the restrictive Canadian immigration laws and describes the political and cultural situations that led to their imposition. The film addresses the hardships faced by the early Chinese workers who came at the time of the imposition of the “Head Tax”, and the Sikh immigrants who came in the early 1900s, restricted by the “Continuous Journey” laws. The impact of these restrictions on immigrant travel, arrival, and employment is demonstrated. Both groups were effectively prevented from bringing their wives and families to join them by Canadian immigration laws, resulting in a male-only community with a total lack of women and children. The film uses the community of Tod Inlet to show the general impact these laws had on two different Asian immigration groups, and compares the responses and results. The film also contrasts the conditions faced by the immigrants and the state of their living quarters with the homes of the engineers and other white workers brought in to operate the cement plant. The two faces of Tod Inlet are seen in archival photographs of the white worker's houses and rare photographs of the Asian worker's shantytown. The photographs are accompanied by verbal descriptions of the incredibly poor housing conditions by people who lived nearby. In the absence of official census and directory records for the Asian labourers, interviews with elders in Victoria's Chinese and Sikh communities are used to tell the story of their community: their immigration experiences, cultural interactions, and their working and living conditions. The Asian workers were exploited: for their high risk work in the quarries and heavy labour carrying bags of cement from the plant to the ships that carried cargos along the Pacific coast, they were paid roughly half that given to Canadian employees. As reported in the local newspapers of the day, tuberculosis and typhus were rampant, and many immigrants died from accident and disease. Filmed interviews of the immigrants’descendants telling their own family stories will show the specific and personal impacts of the restrictive immigration laws. The audience will hear of Thakar Singh: “He never saw his wife again!” and Yat Tong, who waited decades to bring his daughter to join him, and others who had to travel back to India and China and wait years before they could finally bring their familes to Canada. The film concludes with stories of individual immigrants and the contributions they and their descendants have made to Canada, in spite of the harsh immigration restrictions imposed so long ago.